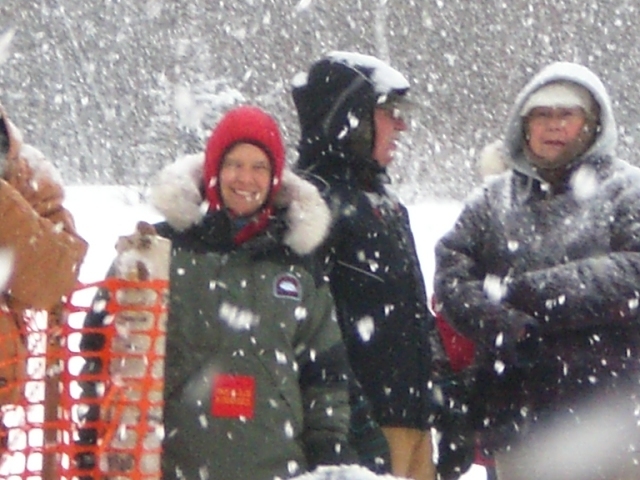 Terrie Hanke, a physical education teacher at Eau Claire, Wisconsin’s North High School, is in training for Iditarod’s Last Great “Teaching and Learning” Race. 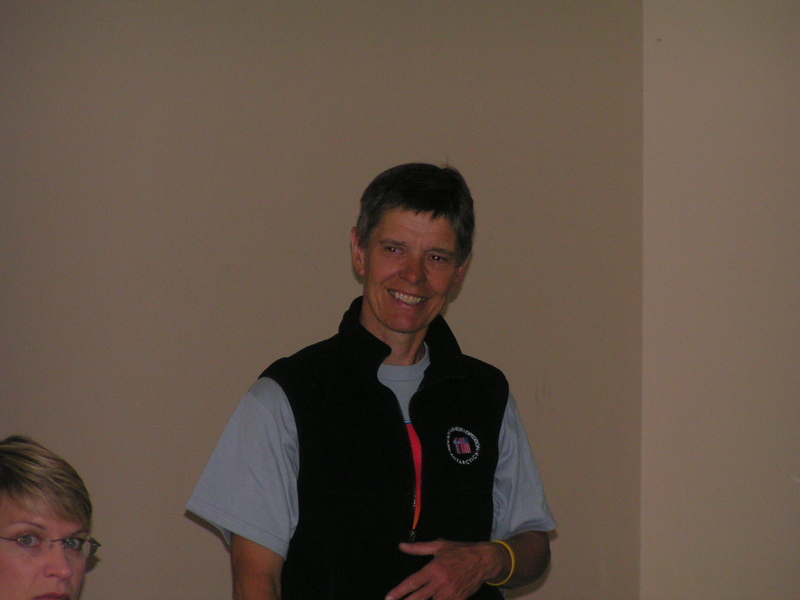 Terrie was selected as the 2006 Teacher on the Trail™. 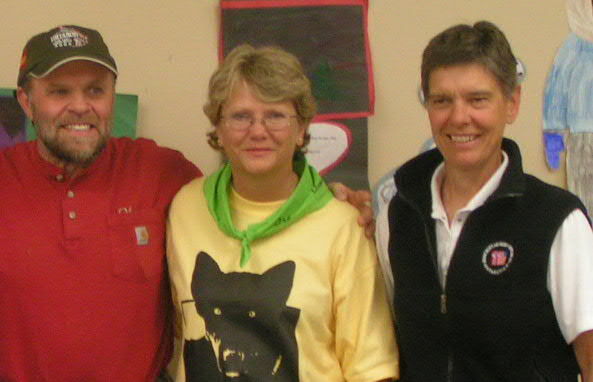 She is the eighth Teacher on the Trail™ to be selected by the Iditarod Trail Education Committee. 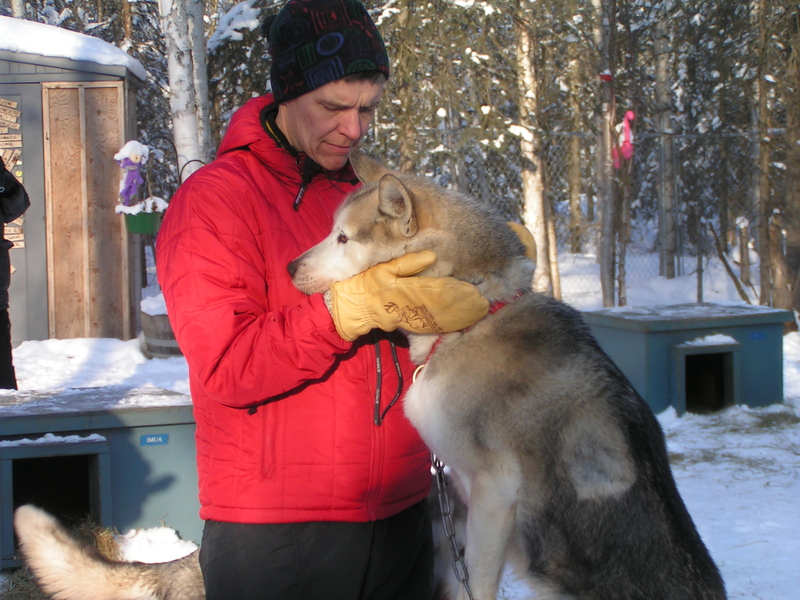 Handling sled dogs, volunteering at the checkpoints, writing lesson plans on the fly, and linking up through the Internet from rural Alaska, along the 1,150-mile Iditarod Trail, are among the challenges facing the 2006 Teacher on the Trail™. Terrie graduated from the University of Wisconsin, La Crosse, with a degree in Physical Education. She accepted a junior high position in southern Wisconsin. After a year, Terrie was desperate for snow and moved north, to teach and coach at her alma mater, North Senior High, the home of the Huskies. “The greatest reward of coaching is to watch young athletes set goals and strive to maximize their potential,” Terrie stated. She has taken many teams and individuals to the state tournament level and is proud of the two WIAA State Championship golf teams and one individual WIAA State Champion who has competed on the LPGA Tour. 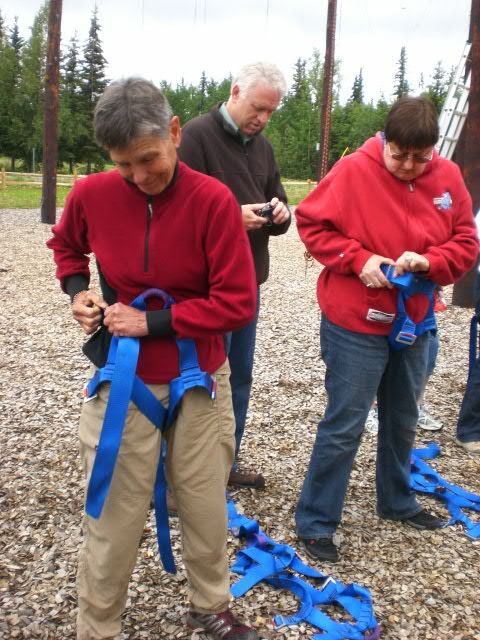 After attending Iditarod’s Summer Professional Development Conference for Educators and Fans in June 2003, Terrie implemented Iditarod as a thematic tool to deliver curriculum, creating a new level of excitement to planning, implementing, and evaluating lessons. 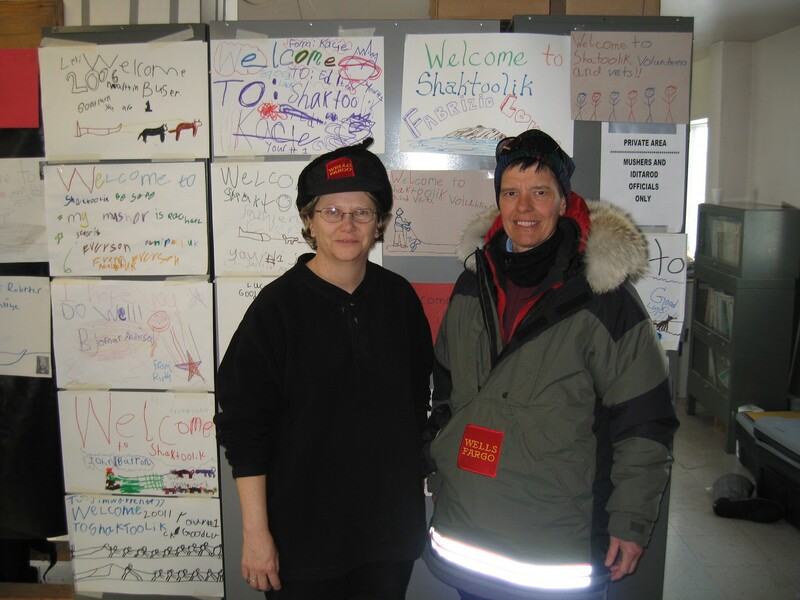 Her students and athletes enjoy learning through the Iditarod for all the same reasons that elementary students do. 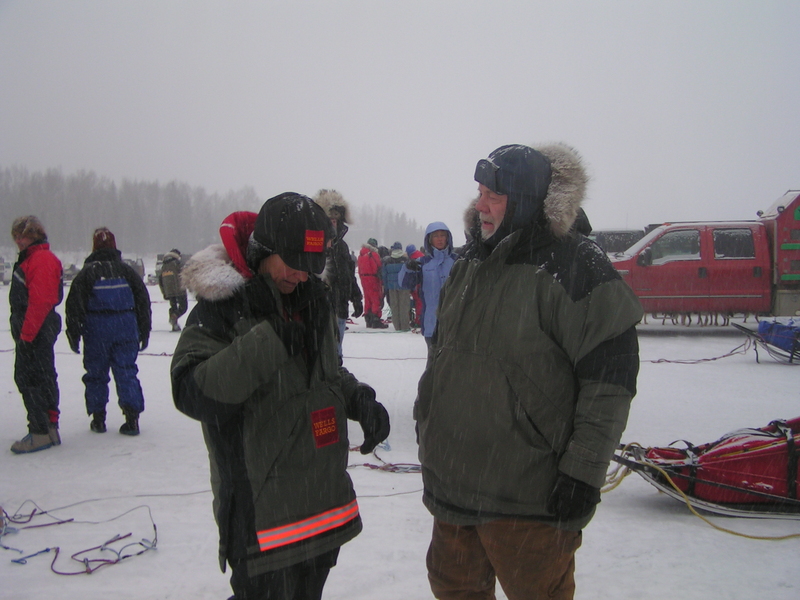 The athletes journey each season from “Anchorage to Nome” as they track their progress and see improvement on their goals. Terrie has found that the player’s motivation level has increased and that they are eager to work to achieve their goals. 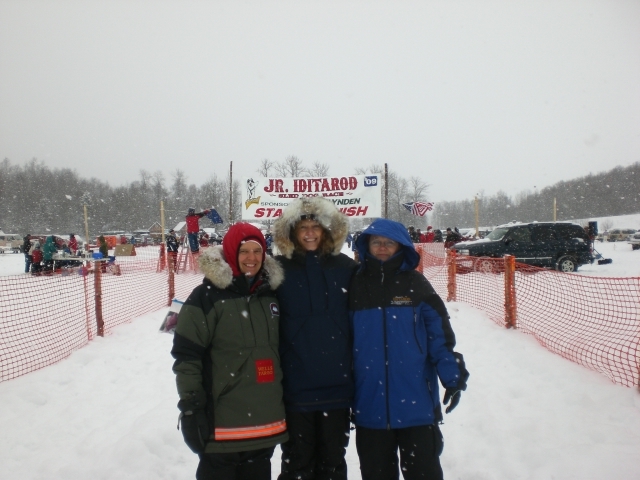 Iditarod has become a teaching tool and symbol for the character traits students and athletes must develop to be successful. Through the Iditarod, the golfers have learned that “together we succeed” and that “attitude is everything”. 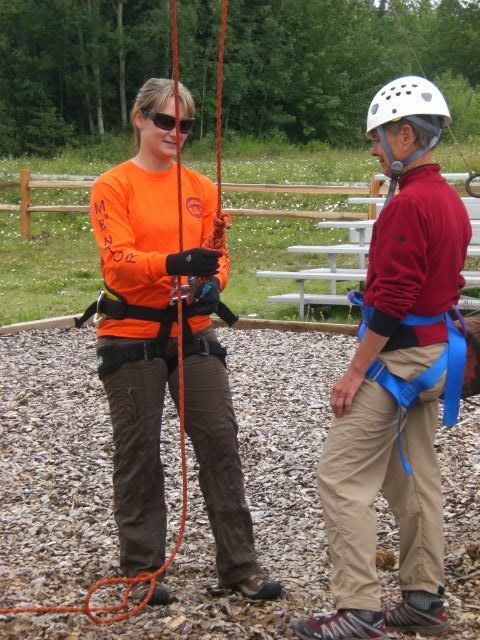 When not teaching Physical Education, Driver’s Education, or coaching golf, Terrie enjoys the outdoors. 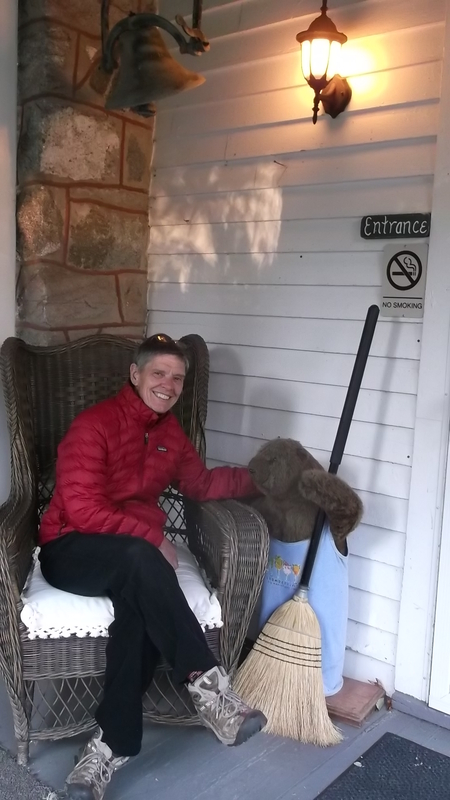 She likes to golf, fish, camp, swim, run, bike, ski, snowshoe, and lift weights. 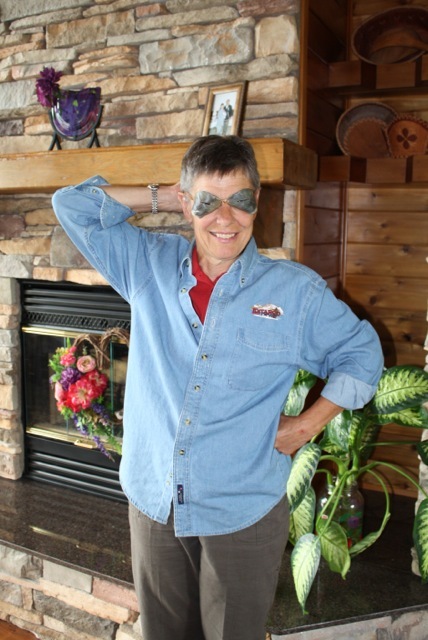 She enjoys building, woodworking, caring for her lawn, nurturing her plants, reading and traveling. 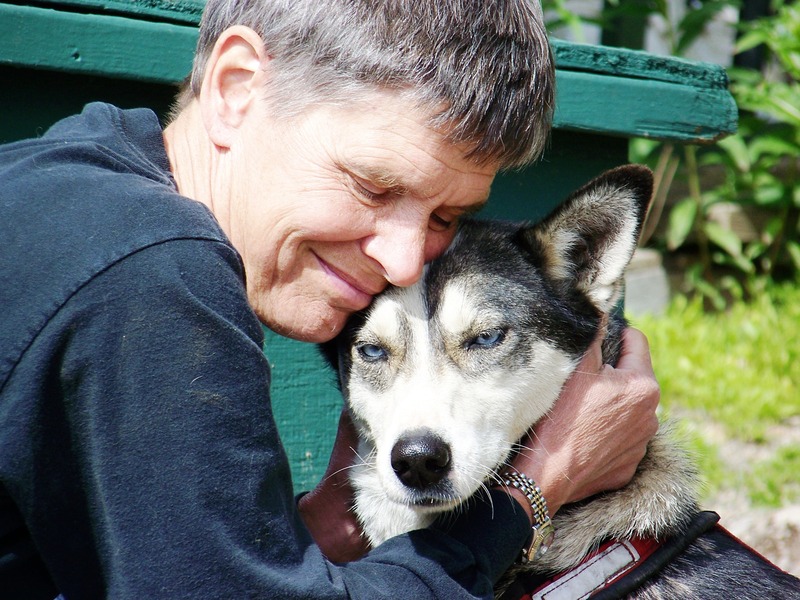 She lives with 3 cats and spends time with dogs at the Just Guts Kennel, as a dog handler. 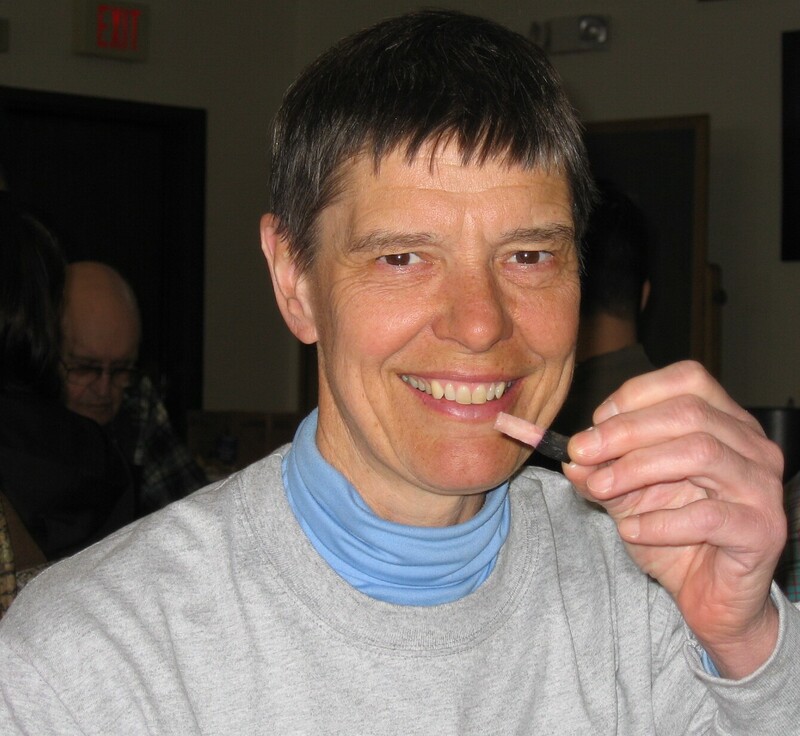 Click here to read the original press release for Terrie Hanke. Update 2009: Terrie has retired from teaching. 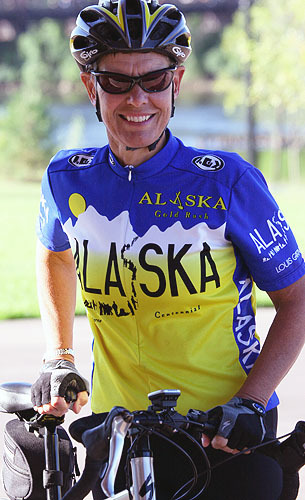 She is a member of the Iditarod Educational Selection Committee and assists with the teacher’s conferences. 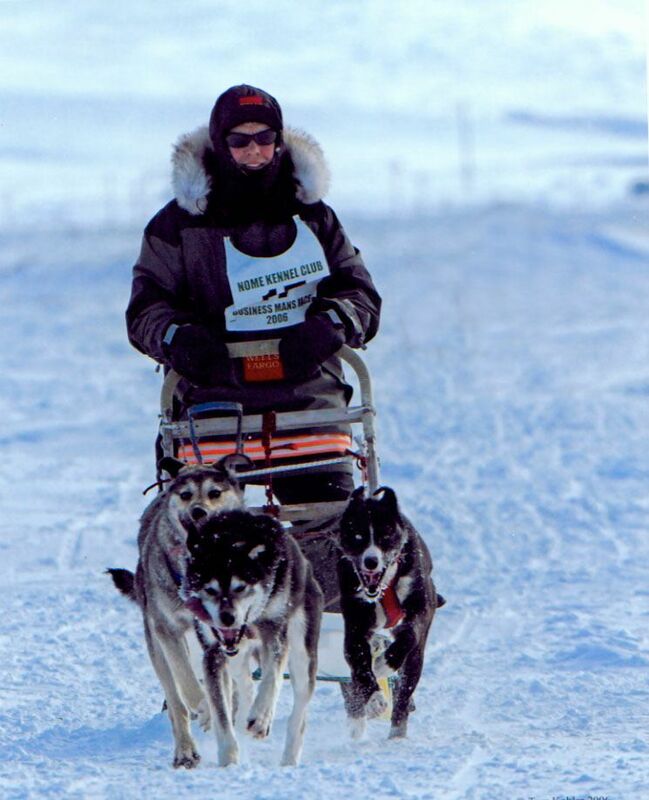 Each year, Terrie provides dozens of presentations at schools and community groups in Wisconsin, sharing the lessons from Iditarod. 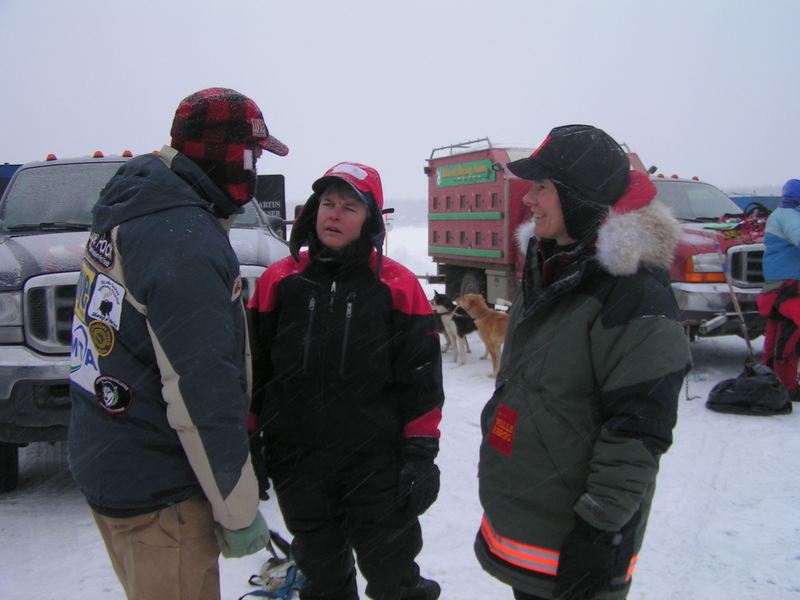 Terrie works with Sanka W. Dog, one of the famous K-9 Iditarod Journalists. If you’re going to live where winter lives, you’d best enjoy snow and cold. 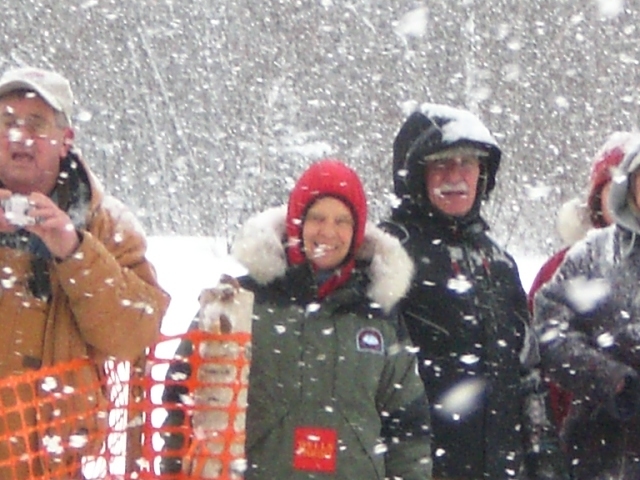 Dog teams aren’t as plentiful in Wisconsin as they are in Alaska but Eye on the Trail journalist Terrie Hanke, has been handling dogs and mushing recreationally for 15 or so years. 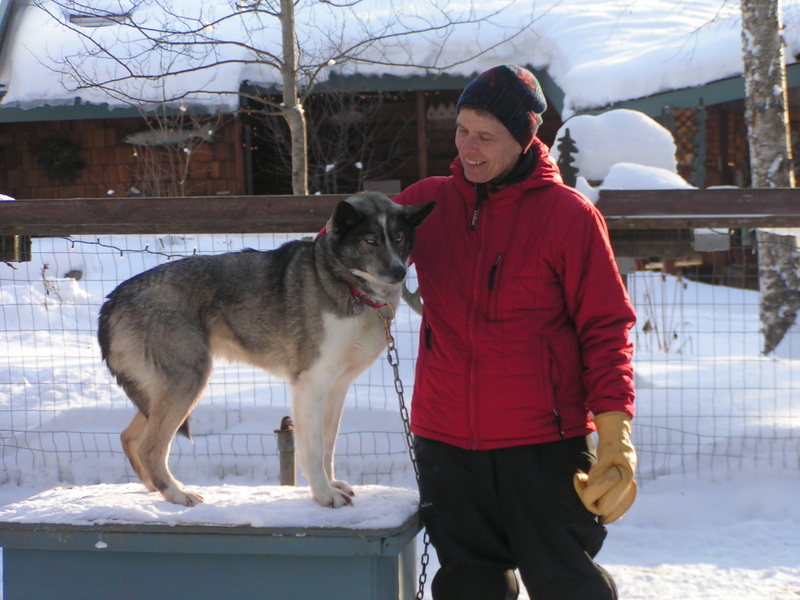 Northern Wisconsin has its share of sled dog kennels and there are many races, mostly sprint races, in nearby Minnesota and Upper Michigan. 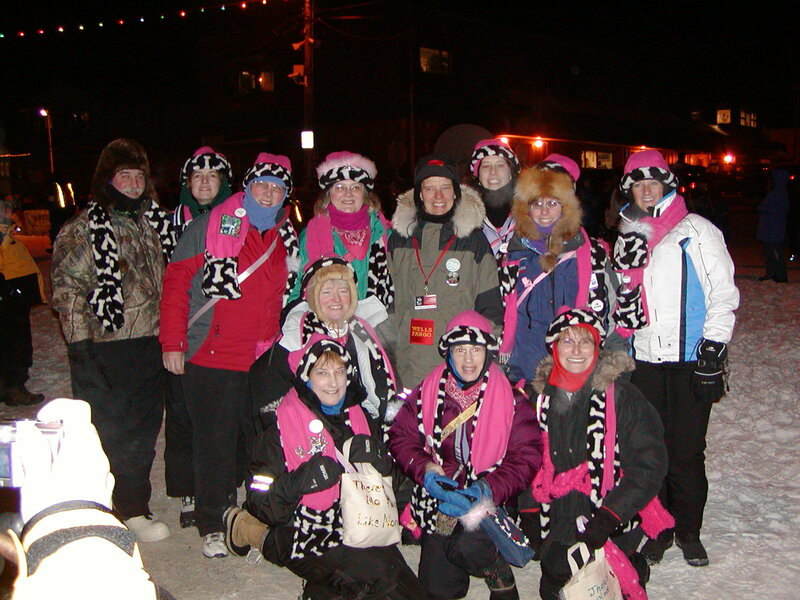 Unlike Iditarod, races in and around Wisconsin are usually supported. 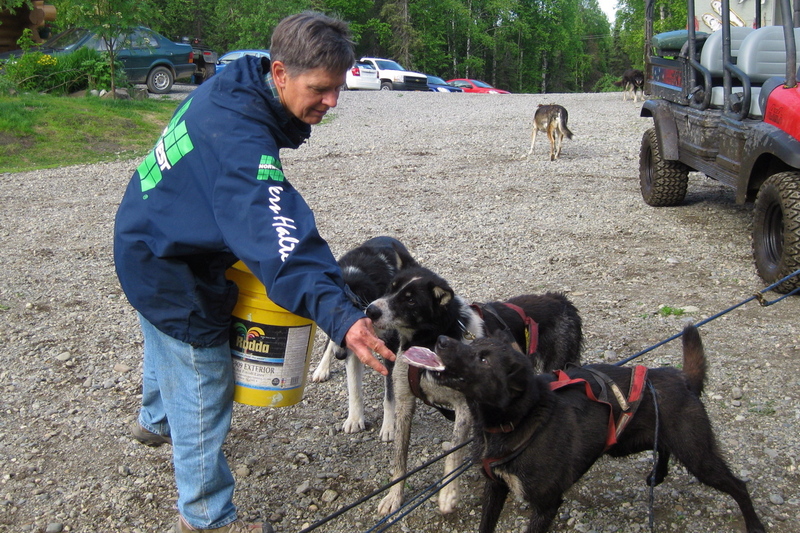 Handlers drive to the checkpoints and deliver food and supplies to the teams and then assist with feeding and dog care. Handling for a team competing in the infamous Bear Grease, a marathon race run in the Arrowhead of Minnesota is both intense, exhausting and rewarding. 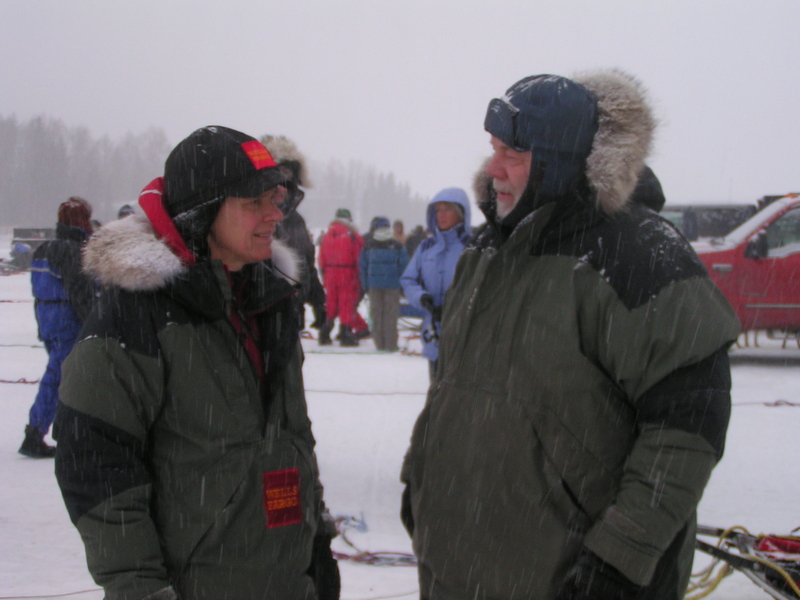 The weather extremes and challenges of the trail can be almost as challenging as those of Alaska races. 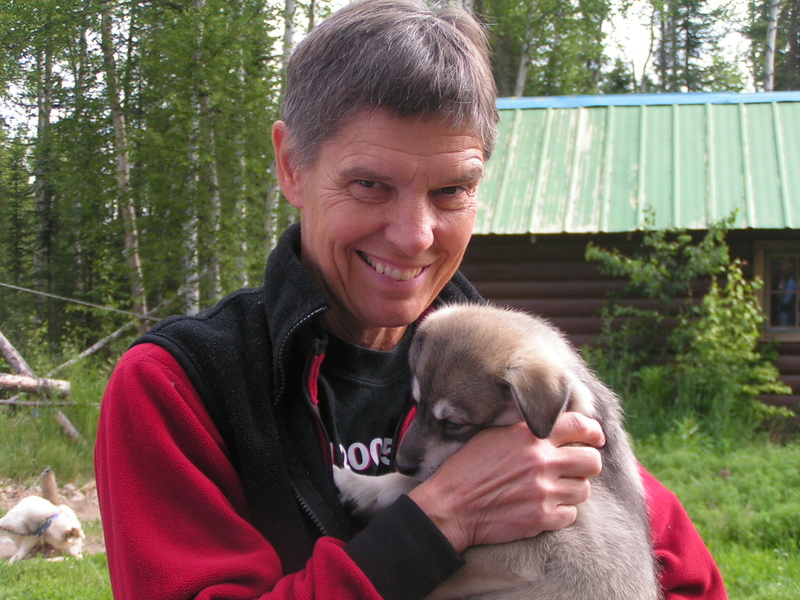 Teaching at North High School, home of the Huskies, Terrie became interested in Iditarod as a theme for education. 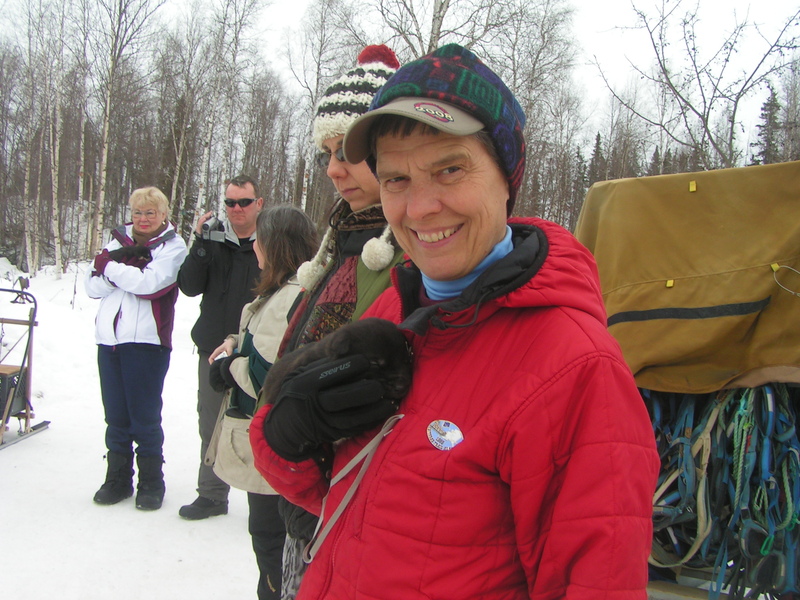 While attending a Summer Iditarod Educator’s Conference, she learned about the Teacher on the Trail position. Terrie was selected to serve in that capacity in 2006. 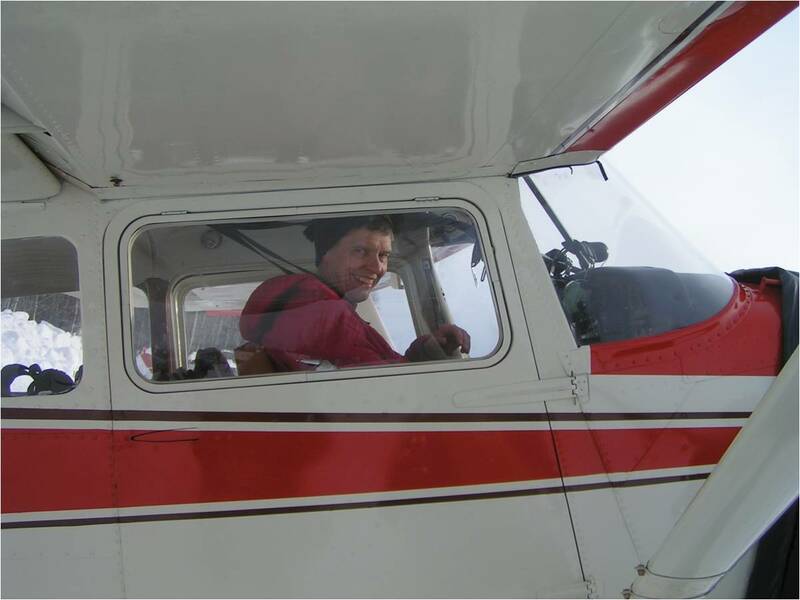 Covering the length of the trail by either bush plane or snowmachine, visiting checkpoints, meeting villagers, chatting with students, collaborating with teachers, creating lessons, posting stories—all of the things the Teacher on the Trail does—cultivated a soulful sentiment for the Last Great Race. 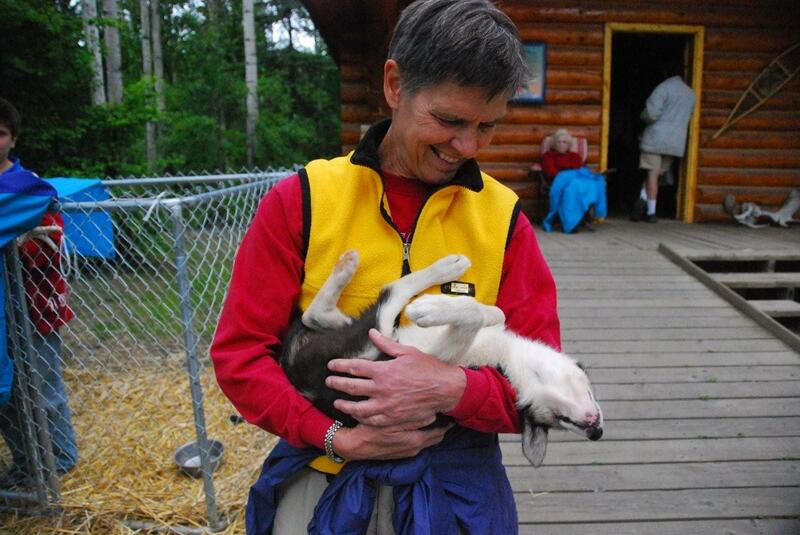 For Terrie, being in Wisconsin while Iditarod is happening would be unimaginable. 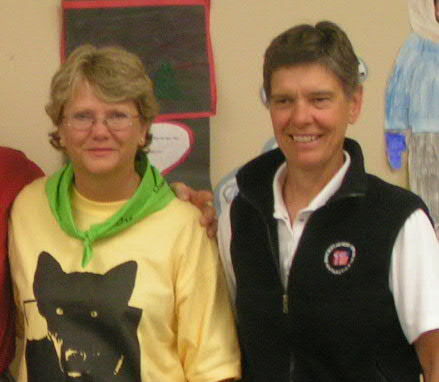 Since serving at the Teacher on the Trail™, she continues to volunteer for the race in many capacities including serving on Iditarod’s Education Committee, race communications, timing and support for the Junior Iditarod along with writing and sharing trail stories with race fans, students and teachers through Eye on the Trail and Zuma’s Paw Prints. Terrie is a member of the Teacher on the Trail™ selection committee and serves as the mentor/coordinator for the selected teacher. 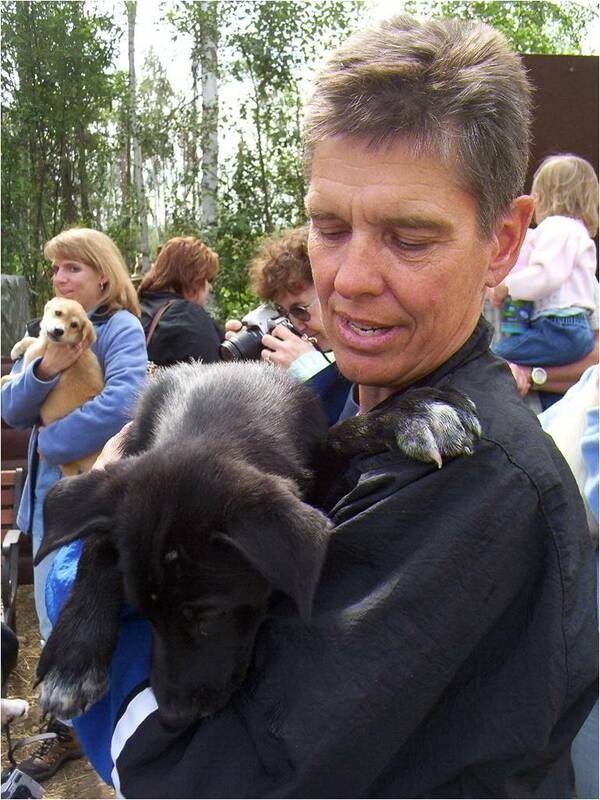 Terrie’s skills are endless and her devotion to the challenges of the Iditarod Education Department are greatly appreciated! 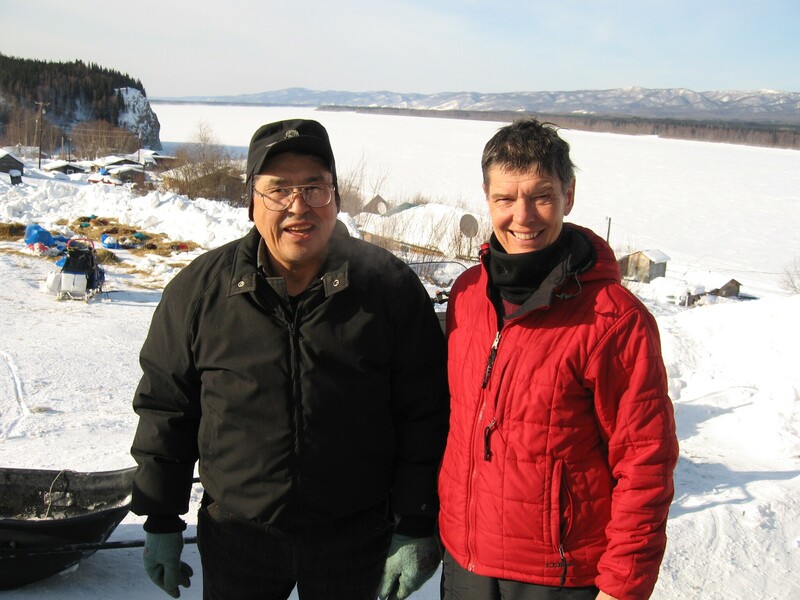 Not only does Terrie serve as a staff member at the Iditarod Winter Conference and Summer Camp events, but she now has taken on the task as ‘Chef Terrie’ for Iditarod Summer Camp. 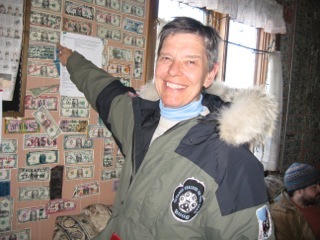 What do our race fans have to say about Terrie’s journalistic contribution to the Iditarod? Here’s an example…. 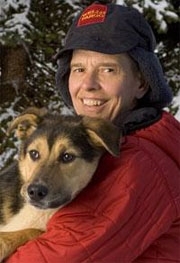 Terrie,I want to thank you for the excellent profiles you have been writing about the mushers at the back of the pack. 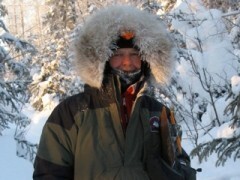 So much coverage ends after the first several mushers arrive at Nome, but I watch for all the racers and my favorites. 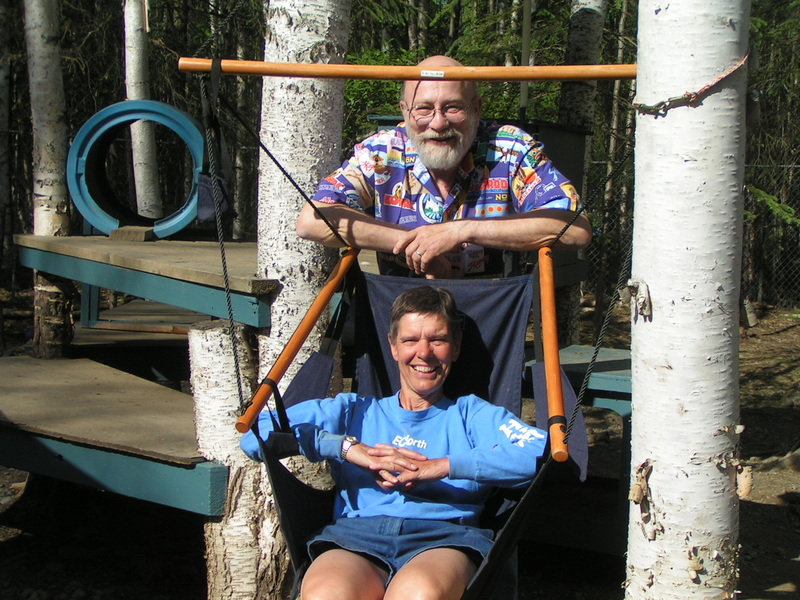 Your interviews, particularly in White Mountain, are thoughtful, three dimensional, and very realistic. I truly appreciate the care you put into your posts and the details which make these rookies and racers come alive. 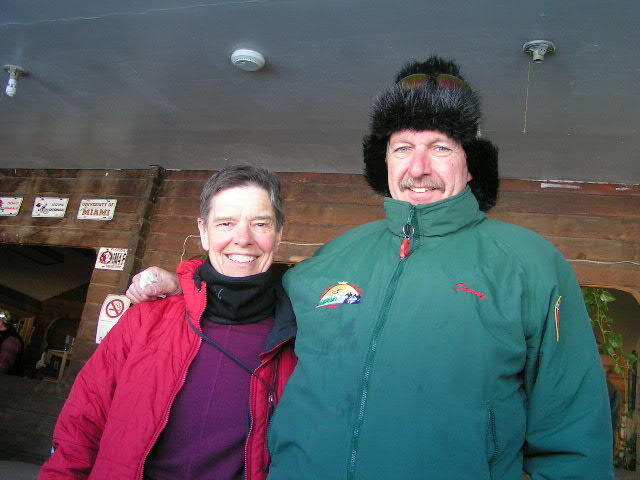 No wonder you continue to be a special Iditarod teacher!